Glassfibre reinforced concrete (GRC) is the most complex material widely used in current construction practice. It is an unusual composite, in which both the matrix and the reinforcement themselves are composites. 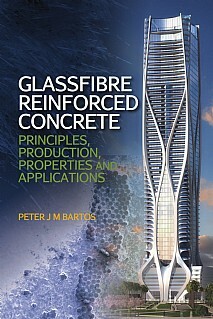 This book provides guidance on the properties, its specification, testing and the latest methods for efficient production. Detailed information is presented about the unique aspects of the internal structure and fracture mechanisms of GRC and how the latest advances in nanotechnology are leading towards a fuller understanding of the rational design of GRC and the potential for further improvement of properties beyond those used in contemporary construction practice. GRC is already firmly established as the high-tech material of choice for architects and designers and recent decades have witnessed a rapid increase in production of GRC world-wide. However, to provide the full picture and encompass the most recent developments in GRC and how it can be exploited in major projects, a substantial part of the book is made up of case studies. GRC has been always a very versatile material; however, its range of practical applications has grown significantly. From small, simple items (flowerpots, drainage channels, window sills, etc.) to large-scale, high-tech iconic projects from leading architects, where GRC has to cope with the highest demands regarding structural complexity, freedom of shape, striking appearance combined with durability and overall quality and excellent environmental performance. The composite is well used in the reconstruction of complex historic facades and GRC has moved beyond construction into the domain of art and interior decorations and furniture. The case studies show numerous examples of such designs and products, including recently developed large double-curved panels with unusual surfaces and strong colours, and self-cleaning and photocatalytic (air-cleaning) e-GRC. The book provides a state-of-the-art review of GRC for all professionals in construction, from architects, designers, civil engineers and end-users to existing and new GRC manufacturers and developers. It will be a valuable reference for students in these disciplines.